A new favourite pen for me! I’m not kidding. I have liked and loved many pens, but this pen, the Sailor 1911S Demonstrator, has become a true favourite: I’ve had this inked up non-stop since I got it a few months ago, and written it dry several times. At first, we expanded our Sailor line a bit slowly because we wanted to have more nib sizes available in each finish we did carry, and also good stock for the online side of things, but we’ve started to bring in more finishes, in the most popular nib sizes. This way people can take a look at them in the shop and see the different colour options available, and of course we can always bring in a nib size if the one you want in the finish you like isn’t here. However, they say Sailor makes some of the best nibs, so maybe that’s it, too. It’s honestly one of my favourite pens to write with, and as a bonus, I also love the way it looks. While I’m usually into brown pens (and inks), I’ve been on a real demonstrator kick lately, and the Sailor 1911S started me on it. I thought about a Realo (the piston fill), or the 1911S in the yellow, but I couldn’t resist the clear + gold. It’s clear with gold trim, which I know isn’t for everyone, but I find the gold isn’t so much to be overwhelming, and it matches the clear very well. This is a light pen, which is great for someone like me, as I find the big and heavy pens are hard to write with for a long time. 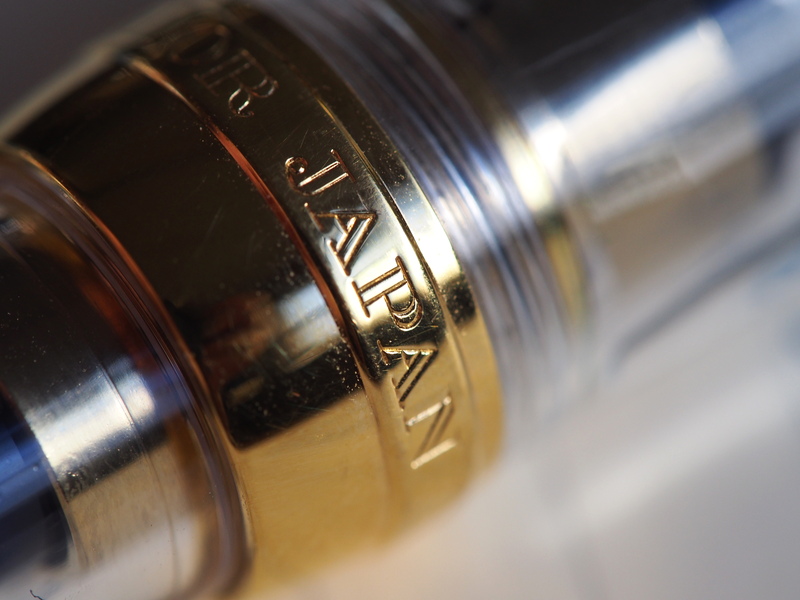 However, the details, especially in the nib, show a lot of time and care has gone into it – despite its light weight, you can’t mistake the quality. While I can’t say that I’ve never purchased a pen solely based on how it looks, for this pen, it’s the nib and the writing that have really won me over. 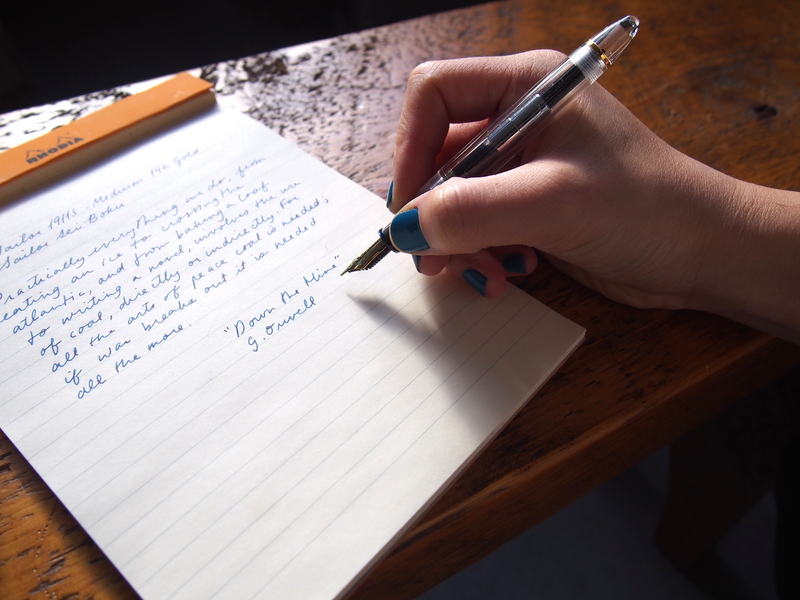 I find I reach for this pen over and over, especially for longer writing sessions, like in my journal. Combined with the nice size and weight in my hand, this pen is a new regular in my pen roll (which is still light brown, although I’m working on convincing Jon that I need a natural one). I have a medium, which is on the finer side of medium, although this is Rhodium Premium “R” paper, so ink might write just a touch finer than it would on more absorbent papers in any case. I would compare the nib to a Lamy Fine, or maybe just wider, but not as wide as a Lamy Safari Medium. Oh, Sei-Boku, one of my top 10 inks of all time. A desert island ink, for sure, because in addition to its great colour and shading, it’s permanent! Gotta watch out for those ocean waves. 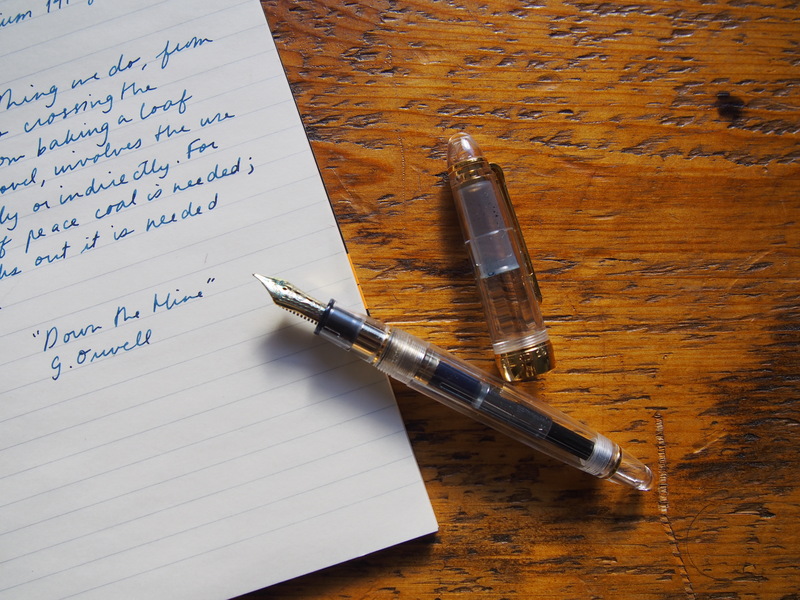 It’s a smooth & clean nib, with just the right amount of flow, on the wetter side of average. Of course it has no skipping or hard starts, but it’s more than that, it’s just the way it feels! 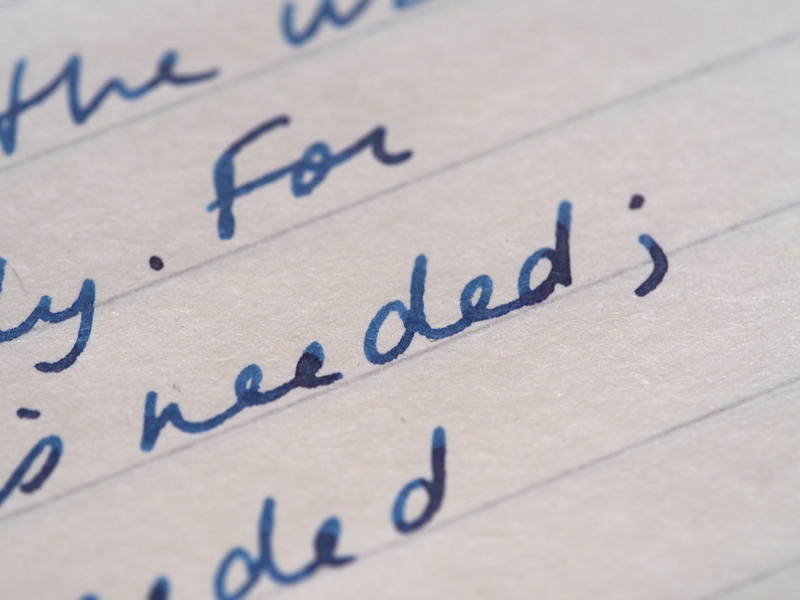 It’s consistent and easy and the contact with the page – this pen just works for me. 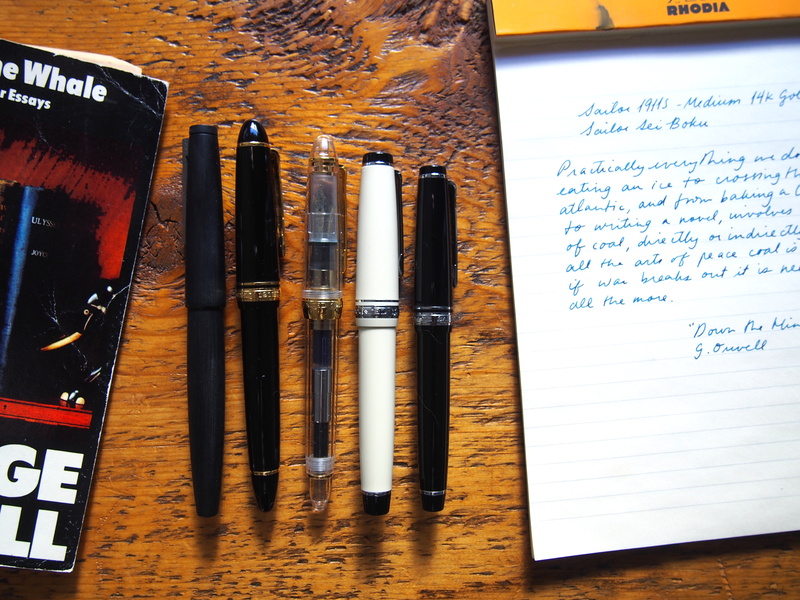 Among others, I’ve used Sailor Tokiwa-Matsu, Diamine Ochre, and now Sei-Boku, and all have been a pleasure. You can get a hint of variation out of the nib if you really make an effort, but this isn’t a really soft gold nib as far as standard gold nibs go. You get some feel out of it, but not too much variation. 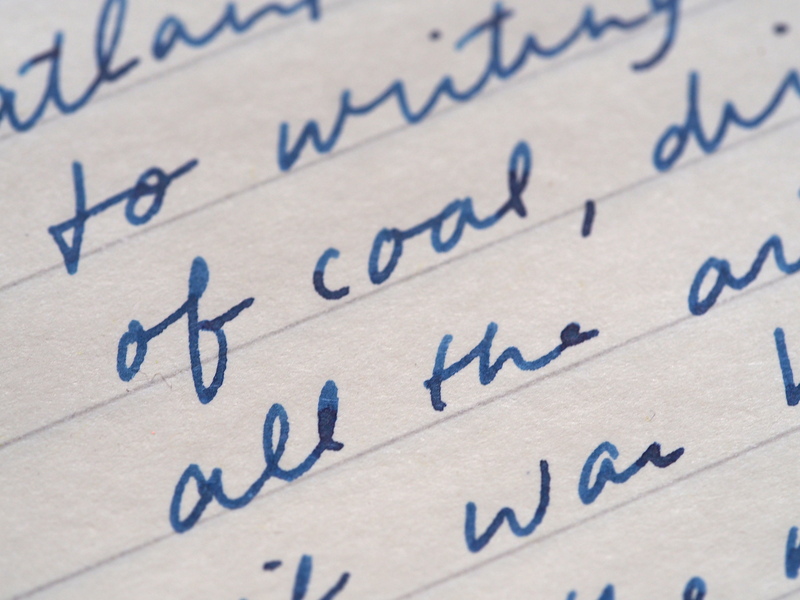 It’s just the very tiniest bit of responsiveness that gives you a sense of the paper underneath your nib. What a beauty! I’m not usually someone who is really into how the nibs look (is that a guy thing?? ), but I have to admit that Sailor nibs really are something else. It’s the anchor, the font of the 1911, the whole thing. The Sailor 1911S is the 1911 Standard, as opposed to the 1911L or 1911 Large, which would be the larger size. The Professional Gear & Pro Gear Slim series have flat ends with the Sailor anchor logo on the end of the cap, compared to the 1911 series, which have rounded ends. 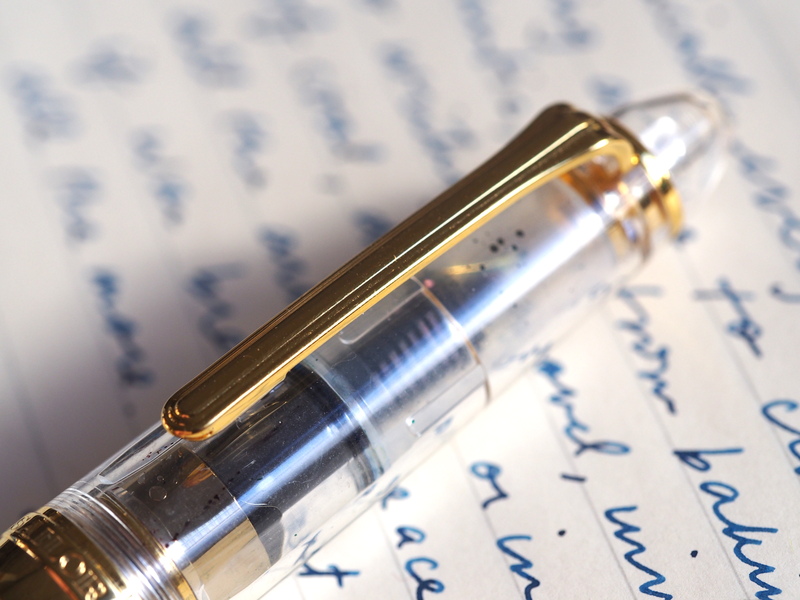 I always thought I was more of a flat end person, given how much I like my pens like my TWSBI 580, Lamy Safari & 2000, Edison Beaumont, etc., but actually I am loving how this Sailor looks, of course also because it’s the clear & the gold. It’s a bit bigger than the Pro Gear Slim, but it’s not a large pen. It fits my hand very well, unposted, but if you have larger hands, posting it may be better. 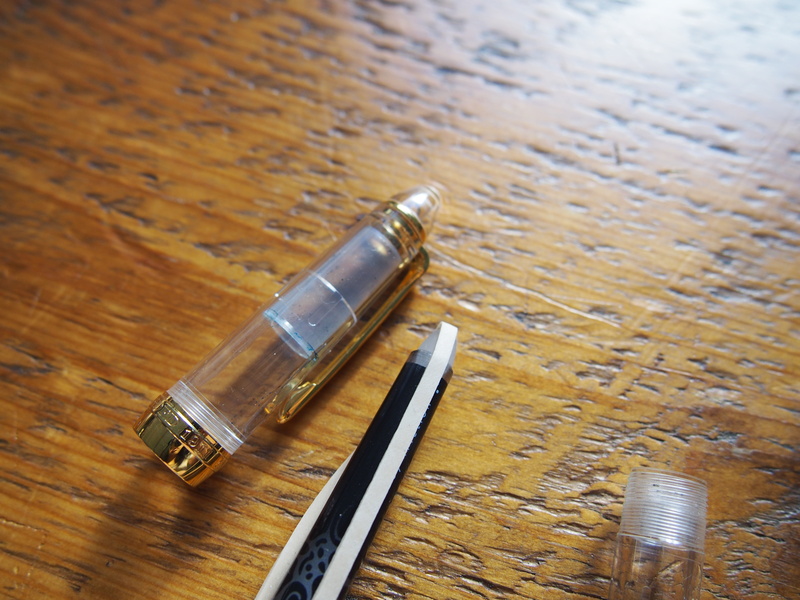 The demonstrator version of the 1911S has a clear cap, which means that you can see the inner cap, which helps prevent the nib from drying out. If you do get ink stuck there, you’ll be able to see it, but like most inner caps (like on the TWSBI 580, Kaweco Clear Sport) you can also remove it fairly easily and wash + dry. 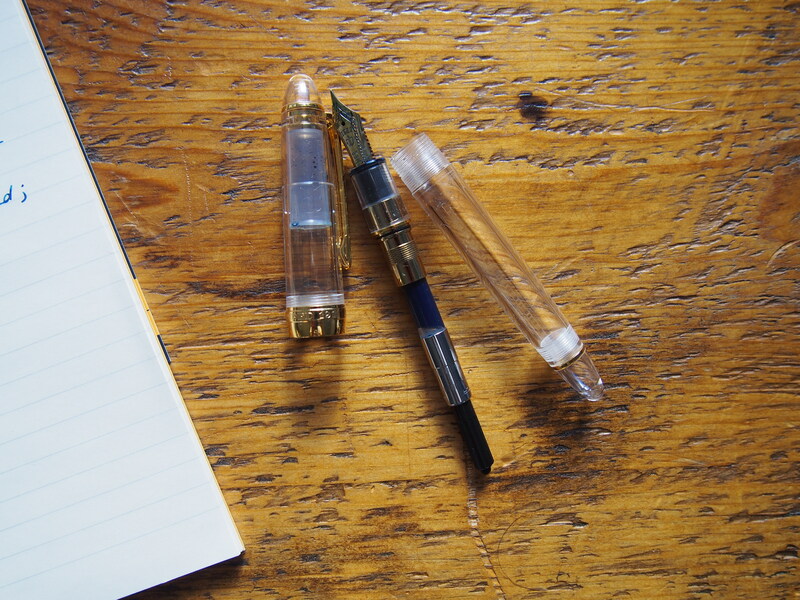 As an aside, sometimes it may look like a pen has a leak, but actually almost all pens will get droplets of ink inside the cap from time to time, especially if you’re carrying them around or moving from different temperature extremes – it’s just more obvious when the cap is clear. 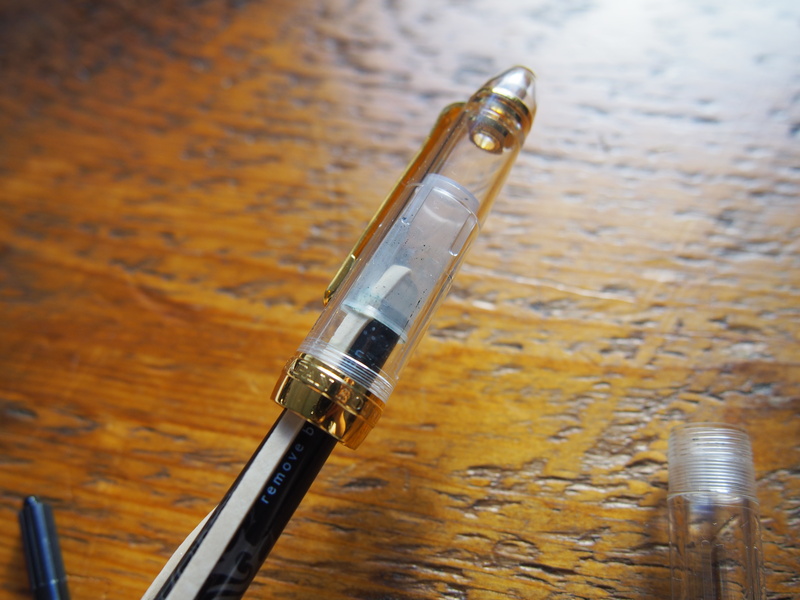 You can see the inner cap, which is the translucent white cap inside the pen cap. There’s a few droplets of ink in there, which won’t bother me unless it starts accumulating into something a bit more. You need a pencil/chopstick/thin pen and an elastic band, preferably a thicker one like you might get with broccoli. Wrap the elastic around the end of your stick, and push it all the way in. Twist and draw out. Wrap your elastic around the end of something slim, like a wooden pencil or the blunt end of a chopstick. Get it in there nice and snug, and the elastic will provide the traction to pull out the inner cap. Twist as you pull back. To get the cap back in, just push it in with your finger, and you can close your nib back into the pen and close the cap as you normally would. 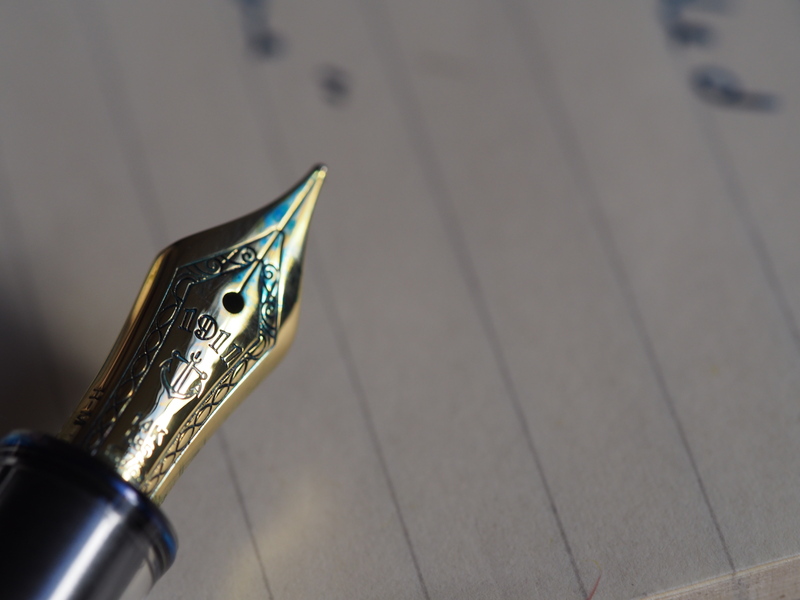 There’s no danger of damaging the tip of your nib because the inner cap was designed to seal up around the nib and section. A great pen! 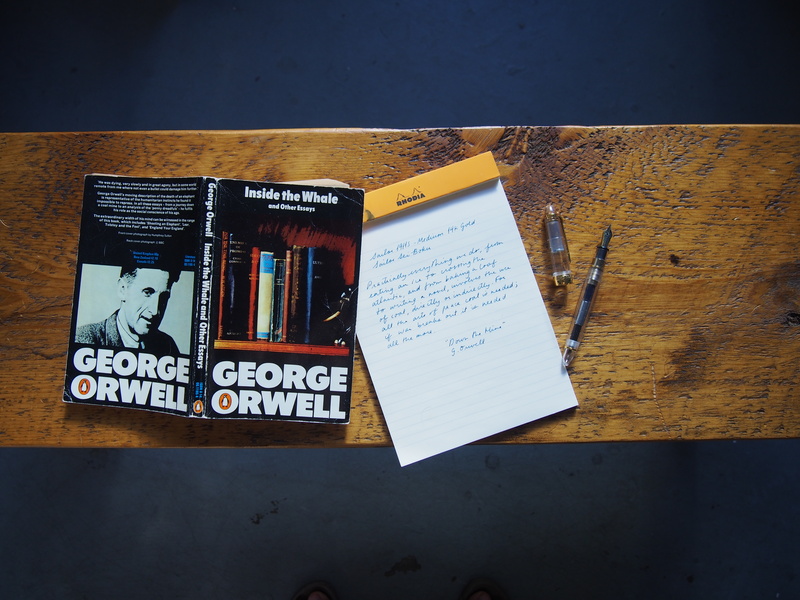 It’s truly now a regular in the rotation, a good size, a good-looking pen, and a great writer. Not much more you need out of a pen. This pen has been popping up all over instagram every time I take a shot of whatever I’m using at that moment. Every once in a while, Jon tries to borrow it so he can show a customer how it writes, and he basically has to pry it out of my hands while saying “Careful! You’re going to break it. Let go, Liz.” Which is mostly about the fact that he borrows it and I don’t get it back until the end of the day. In any case, hope you’re all having a great Saturday and start to your weekend. It’s a bit chilly out, but it’s bright and sunny, so there’s no complaints here. I guess because winter started so late for us here in Toronto that I’m not completely depressed and cabin-fevered about the cold weather and hibernation (yet). It’s still been nice and busy in the shop, and keeping your orders packed up. We’ve had a few burst cartridges in orders we’ve been shipping out, which is a real bummer, but unfortunately there’s nothing we can do to help keep those from bursting. We’ve started siphoning off ink from bottles into vials, especially for Noodler’s bottles, for most provinces now – back to our glory days of a sink full of syringes. Caleb & Super are as squirrelly as ever. Super just runs away every time he does something bad and he’s about to get in trouble, but Caleb’s pretty slow moving, so he just looks up at you and smiles. You think to yourself, ‘alright, he’s learned his lesson.” But then two seconds later, he’s into some new sort of trouble, probably something along the lines of breaking merchandise or eating something off the floor. I’m loving this pen! I just got mine back after having the nib ground to a stub, and it is spectacular. Hmm…I don’t have that yet. I know that’s much more common in the Kaweco Sport. Did you get your Sailor from us? Interesting. I have an 1911 demonstrator that I’ve had for 4 or 5 years. It developed the problem with ink leaking into the grip section of the pen right around what looks like a rubber seal. That’s 2 of us. I’ve been in touch with Jeffry Fridfinnson to have a look at my pen and I mentioned to him that Heidi has the same problem. It might be helpful if he had a look at both pens to see if there is an inherent defect in this model. I’m sorry to hear this! My Sailor is still going strong, but I’ve only had it for around 5 months now. It doesn’t look like you purchased the pen from us (we’ve only been in business three years! ), but I would recommend going back to your original retailer and seeing if they can help you out – for example by sending it back to the distributor to see if there’s been an update on the grip to improve possible leaking? Since I found you I have bought a Kwaeco from you and just a couple of weeks ago a TWSBI vac 700 demonstrator which I’m loving. I generally only take cartridge pens when I leave comforts of the office so I wouldn’t get caught running out of ink. I’ve added the TWSBI to my travel inventory now because it has that huge tank and I can see how full it is. It writes like a dream and it allows me to use my collection of inks. It’s my favourite out of the office writing pen along with my Platinum 3776. In any event when I was last in your shop you game me the contact info for Jeffry Fridfinnson and I’ve arranged for him to have a look at the Sailor. I’ll let you know what we find out. I can imagine how the Vac700 would be perfect for your needs, especially since you can see how much ink you have left, and on long trips where you don’t want to worry about running out of cartridges. Would it be possible to get this in a Zoom nib? It’s the perfect size and weight and of course, i love the way it writes.